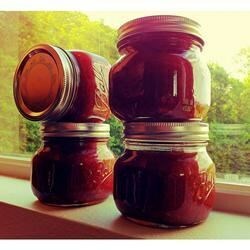 "Although apple rhubarb jam may sound weird, it is amazingly delicious! You can substitute strawberries for the apples to make strawberry rhubarb jam." To make strawberry-rhubarb jam, replace the apples with three cups of strawberries and the pectin with one 6-ounce box of strawberry gelatin. This was truly good. I tweaked this a bit as I used 4 cups rhubarb and 2 cups apples and it was lovely. yum. It made about 6 cups so only about 4 jars of jam. This jam is amazing! I used a bag of frozen rhubarb and it was perfect. Everyone who tries this raves about it! Thank you Amanda! This Jam reminds me of my absolute favorite pie in the world, apple rhubarb. So easy to make and just the right amount of sweet tart.